It’s been a while since I last posted, and this is the reason why. 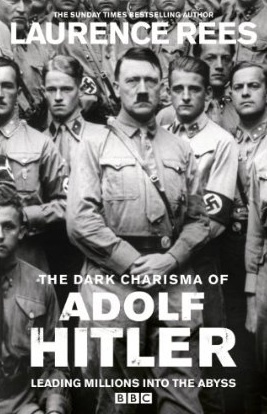 I’ve been hard at it finishing the proofs of my new book – The Dark Charisma of Adolf Hitler: Leading Millions into the Abyss – which is published in September. It addresses a question I have been fascinated by for as long as I can remember – how was it possible that millions of people so adored such an appalling figure as Adolf Hitler? Many Germans who lived through that time, who I met over the last 20 years, talked of being ‘attracted’ to Hitler and a number characterized the nature of this attraction as ‘charisma’. So what is ‘charisma’? For sure it’s not like Hitler ‘hypnotized’ anyone – the people who followed him did so out of their own free will – more that there was a powerful connection between leader and led. What was the nature of that connection? I’ve been working on the book for nearly 4 years now, and try to see how far I can go towards explaining this mystery. It’s an issue that goes to the heart, I think, of some truths about the nature of our lives: the desire for meaning, the longing for salvation and redemption, and the craving many people have for some kind of ‘savior’ to rescue them in a crisis. This book sounds absolutely fascinating, and I think it asks a question that really gets to the heart of WW2 itself. Can’t wait to read it. This book is aptly named. Perhaps it was “charisma” that was the defining quality of the man. It just go to show that the most evil men of history were nonetheless quite charismatic. Have just started reading this and, as expected, it is fascinating indeed. When is the television series going to be aired? I am sure that I will find this book very interesting. Yes there were people who believed in him for various reasons. Those who felt the Versaille Treaty was too harsh and the Wall Street crash which led to extreme inflation and brought poverty to the German people. Hitler took human rights away from every German citizen immediately after he came to power. Like with Bush if you were not with him you were against him which meant for the poor invidual instant imprisonment or being short. Worse still being hung by a meat hook. Even to refuse to salute the uniform meant one could be shot. I know because my German grandmother told me about her experience when she had to work at a munitions factory in Munster Lager. In fact, many people hated his scratchy voice. I hope the book will show the complexities of how a capative nation was forced to be facinated by such a fanatical and callous man. It’s not only that charisma of the ‘leader’. To leave it to that is far too simplistic. Alice MIller’s analysis, in her book “For Your Own Good: The roots of violence in child-rearing”, both of Hitler, and of the way in which children were regarded, and therefore treated, across Europe as much as in Germany,at that time and for some time before those events, reveals that the willingness of people to ‘follow’ and then to ‘act out’ in the manner that became Nazi Germany has its psychological roots in EVERYONE’s CHILDHOODS…. Times have changed, and yet there is more to do in this area. To omit this area of knowledge in looking at WW2 in any attempt to understand the psychological dynamics of the time is inadequate to the task of prevention of future events of a similar nature. I urge you to read this book as soon as you can. I can’t help thinking that as a human being Mr Hitler was born without any views on race, religion, colur, nationaility and with no resentments or knowkedge of history. There is no such thing as a “racist” gene, which is as a bad an understanding as the genetics as Nazism practised. Any two infants will approach each other as individuals attracted to find someone else of the same size and nature, and without prejudice. Anything else is simply learned. That is the question to understand. Read the article on BBC news website – will get the book. A sub-point of this issue that intrigues me is how Hitler managed to exert his malign influence over so many who associated with him directly, managing to get them to do his bidding and do terrible things that they would not have done otherwise. Not only did he manipulate and terrify the rest of the Nazi leadership in equal measure (including some characters who were pretty unpleasant in their own right), but also the German military establishment, which included many tough but honourable men who you would have thought might not have been easily impressed by such a man. Hitler didn’t only manipulate and terrify these people though, but seemed to spur them on to ever greater acts to prove their loyalty to him. Worse, he even to be able to pick out and motivate many brilliant and able individuals from lowly office to do great things again and again, who seemed so dazzled by his personality that they didn’t question what he asked them to do, right up to the very end of the war. Rommel springs to mind, but he was only one of many who didn’t ask questions until it was too late, and even then his ‘rebellion’ seemed to only half hearted. Curious, as I say.